Comoros took control of its rebel island of Anjouan on Tuesday in a military operation aimed at toppling renegade leader Mohamed Bacar, a government official said. "The operation started in the early morning hours and it is going smoothly and according to plan," Abdourahim Said Bakar, a spokesman for the Union government told IRIN. "The military has taken control over most of the island—the airport and Anjouan's capital, Mutsamudu." The Comoros government, supported by a coalition force of troops from Tanzania, Sudan, and Senegal, with logistical support from Libya, launched the seaborne assault on Tuesday to end the rule of rebel leader Mohamed Bacar, who came to power through a coup in 2001. The military was still facing some resistance close to Bacar's home, and the whereabouts of the former gendarme colonel was unknown, the spokesman said. "We hope that by the end of the day we will have the problem resolved … A special group has been selected to capture Bacar, arrest him, and bring him to court. He has to pay for his crimes." All phone lines to Anjouan have been cut for several weeks, but international news agencies reported blasts and machine gun fire on the island. The political crisis on the Indian Ocean archipelago has been simmering since June 2007, when African Union-monitored polls were held on all three islands—Anjouan (Nzwani), Grand Comore (Njazidja), and Mohéli (Mwali). The Union government backed by the African Union postponed the poll on Anjouan, citing irregularities and intimidation in the run-up to voting, but Bacar printed his own ballot papers, held an election, and claimed a landslide victory. Neither Bacar nor the Comoros Union government, which is demanding a fresh poll, was prepared to compromise. Efforts by the African Union to negotiate a deal had failed to break the deadlock, as had sanctions targeting the freedoms and financial assets of Anjouan's leadership. In February, a frustrated African Union Peace and Security Council revised its stance on the political conflict and moved to backing the Union government's position of using military force. Coalition forces then began gathering on Mohéli, the island closest to Anjouan. A day before the assault, helicopters dropped leaflets on Anjouan warning that the operation was imminent and urging the population to stay at home. The small island is home to 300,000 people out of the 700,000 that inhabit the archipelago, which lies off the east African coast. The spokesman said there were no reports of casualties so far. "Certainly there will be some victims but we think that we can reduce the number to a minimum. Our leaflet warning has worked very well and we believe that civilians will not be hit by our operation," he said. Bacar is thought to lead a well-armed force of about 500 gendarmes and it was widely accepted that any military solution to the stalemate would require outside assistance. "The illegal Anjouan authorities are better prepared and equipped militarily. It should be recalled that twice [in 1997 and 2007] the Union government have been beaten out of Anjouan," Chrysantus Ayangafac, senior researcher at the Institute for Security Studies' Direct Conflict Prevention Program, told IRIN. And despite the Union government's advantage in numbers, "the illegal Anjouan authorities have the military advantage of knowing the terrain," Ayangafac added. The political crisis on Anjouan marked a return to the political volatility that has been a hallmark of Comoros since the islands achieved independence from France in 1975. The archipelago has weathered about 20 successful and attempted coups to date. The Union's complex electoral system gives the three islands a semi-autonomous government and president, and the presidency of the over-arching Union government is rotated between the three islands. The power sharing system was brokered in 2001 by the Organization of African Unity, predecessor of the African Union, in the wake of Mohéli and Anjouan seceding from Grand Comore in 1997, when an attempt by the government to re-establish control over the rebellious islands by force failed. The fragile system has been criticized for being far too expensive, and the question surrounding the allocation of power and resources between the different island governments has been a particularly contentious issue. Given the complexities and history of the islands "any sustainable peace in Anjouan and in Comoros by extension is not a quick fix solution endangered by a military action," Ayangafac said. "While it is plausible that the A.U. and Union government might have a quick victory, the consequences of the military intervention might be catastrophic. 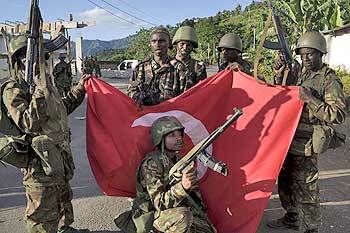 Military action might further polarize the Anjouan society and make it extremely difficult to reign in." "Anjouan is the epicenter of the Comorian economy. It is the richest of the federated islands and its economy is the most vibrant," he explained. The island also has the countries only deepwater port, giving it control over Comoros' international trade and customs revenue. The United Nations resident coordinator in the Comoros, Opia Kumah, told IRIN he could not yet evaluate any potential damage caused by the operation, but said he had asked the United Nations for around $1 million in emergency aid for Anjouan. "We have no access to Anjouan but this is what we think will be needed in such a small country," he said. As soon as Anjouan's airport was secure, a United Nations humanitarian team of around 5 to 6 people would be sent to the island. "We will take care of food, communication, water, sanitation, and all problems that may have hit the island," Kumah told IRIN.